Here is the place we will start to list streets named Bucklin. For those of you who are researching where an ancestor lived, this may give a clue. 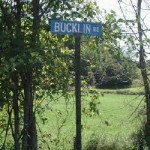 Please send us a photo or at least a note when you find a street named Bucklin. There is a street named Bucklin Hill in the City of Silverdale, WA. The house of Jeremiah Bucklin, which is on Bucklin Road in Adams, MA. The Bucklin family was one of the Baptists who originally settled in the Stafford Hill area they named New Providence. Jeremiah bought this property in 1775. His son, John, later moved to Center Street where he was involved in early manufacturing. This house is unique for its preserved beauty and idyllic setting. The property is still used as a farm today after over 200 years of operation. There are streets named Bucklin in several towns within hiking distance of the original William Bucklin home in 1645. Providence, RI, which street is now the address of Bucklin Park and the West End Community Center. The area of town is now “not a nice place”, and you probably do not want to visit it. Interestingly, Mawney (family name of another of the Gaspee Raiders) Street is in the area and intersects Bucklin Street. Warwick, RI, which street is a small street leading from the main Post Road to Sand Pond, a nice place to build a pioneer home. Pawtucket, RI, which street is near the north border of the original William Bucklin 600 acres and connects between two old streets which still today are major arteries to get from one village to another. Johnston, RI, which like the others above, bear testament to early Bucklins of Rhode Island.